Psychotronic mind warp comes from the mind of Paul Nashy writing under his real name Jacinto Molina Alvarez is the third of his appearances as Waldemar Daninsky better known as the man who turns into a werewolf. The film has a bunch of aliens from a dying planet arriving on earth and inhabiting human bodies. They are looking to wipe out all of the humans so they may move everyone from their world to ours. Their plan involves reviving all of the world’s great monsters, the “Frankenstein” monster, the mummy, Naschy’s werewolf and Dracula stand in. The aliens don’t count on the monsters fighting back or the fact their human forms make them susceptible to emotion. Oddball whiplash sort of film starts off kind of interesting, becomes a WTF bad film before becoming so bad it’s good film in the end, largely as a result of bludgeoning you into submission. The problems with the film is summed simply by saying the film has way too much going on. You have the alien invasion story, the cop story, the romances, the monster story lines, the carryover story line from the last two films involving Naschy’s Waldemar Daninsky plus a couple of other plot points I’ve left out. Things happen and then are pushed aside for something else which feels like its just been picked up at random off the table. It all collides in the final minutes. And those minutes come much too fast, the film runs a breezy 87 minutes. This is a Saturday night at the drive-in or rainy afternoon at the grindhouse sort of film. It’s the sort of thing is have on to have on just to have something on rather than because it’s a great film. Its not one I can really recommend. 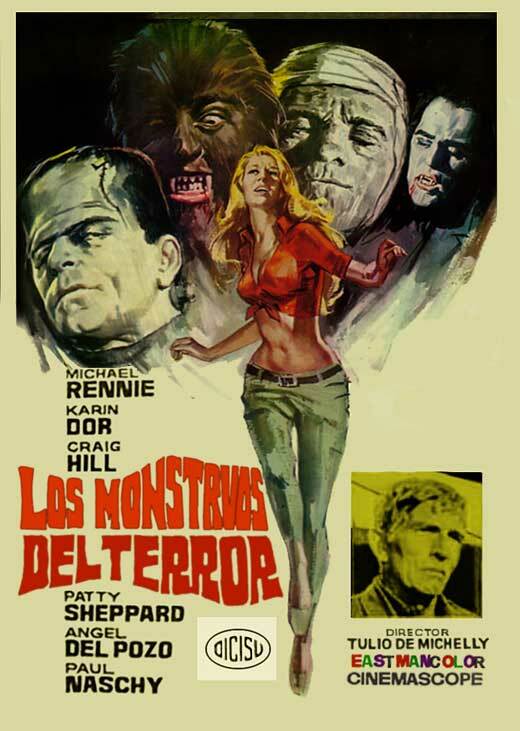 Its of interest for Michael Rennie completists (it’s his last film) or for fans of Naschy’s werewolf-though he spends a great deal of time off camera. (Naschy also plays the Frankenstein monster).